HARTFORD, Conn.—On Nov. 17 Jeffrey Butler, the President of Connecticut’s largest electrical utility company, Connecticut Light and Power (CL&P), resigned amid public outrage following the largest blackout in the state’s history. The blackout was caused by a late-October snowstorm that stretched from West Virginia to Maine and broke October snowfall records throughout the region, cutting electricity to a total of 3 million customers. In Connecticut 955,000 CL&P customers lost power, 77 percent of the company’s total customers. Full power was not restored for 12 days, with many in the dark for a week. This autumnal nor’easter closely followed the late August tropical storm Irene, which also caused major blackouts. Both storms brought numerous CL&P practices to light and raised many questions about deregulation, infrastructure, and climate change. The outage in Connecticut shut down grocery stores, traffic lights, schools, workplaces, and home heating. Affected gas stations were inoperable, creating fuel shortages throughout the state. Many cable and cell-phone services were also disrupted. Thousands of residents took shelter in community centers and schools as the temperature dipped below freezing at night. Halloween in many cities and towns was cancelled due to darkness and downed wires. At least 187 people were treated for carbon monoxide poisoning from using power generators. Butler estimated the storm would cost CL&P at least between $75 and $100 million. The company plans to make up the money through rate increases to customers. According to an early estimate by Kinetic Analysis Corp, damage covered by insurance for all storm-affected states will total between $1 billion and $3 billion. However, barely any of the revenue and income lost because of the power outage itself will ever be compensated since insurance policies rarely cover such losses. The two outages have brought home the impact of CL&P’s staff reductions. CL&P had 430 linesmen in 1976 when they had 850,000 customers. By 2005 they had reduced their linesmen to 190 while their customer base grew to 1.2 million. The International Brotherhood of Electrical Workers Local 420 requested meetings with Democratic Gov. Dan Malloy to discuss low staff levels after Tropical Storm Irene, but the governor never responded. Meanwhile CL&P and its parent company, Northeast Utilities, are doing quite well. In the last four years NU’s earnings per share have increased by 38%. NU’s stock price grew by roughly 25% in the last year alone, and NU’s top five CEOs presently earn a combined $24 million a year. CL&P charges some of the highest rates in the country. The recent outages have raised opposition to deregulation. Cirillo, for instance, has pointed out that delays in turning on the power don’t hurt CL&P’s bottom line. Since, following deregulation, the company is no longer a provider of power the company gets paid whether or not power is on. At a Nov. 19 rally against CL&P organized by the IBEW and Occupy Hartford, some participants called for placing the utility under some form of public ownership. The logic of this proposal is increasingly difficult to escape. In the recent blackout municipal and state workers did an unprecedented amount of the work normally performed by the utility company. Also, the restoration was significantly hampered by the recent proliferation of private companies that must negotiate the restoration of each stretch of line and pole. In addition to telephone and electricity companies are added multiple cable and internet providers. Even large numbers of the poles are now owned by private companies. Public ownership of all these services would cut major costs in redundancy and bureaucracy, and reduce restoration time. In the midst of a nor’easter falling in an abnormally warm October, media outlets have managed to avoid nearly all discussion of climate change. And this was not the only extreme weather of the month. The National Oceanic and Atmospheric Administration reports that more than 500,000 acres burned in wildfires across the U.S., setting a new record for October. Far from a mere “freak” storm (as many accounts put it), climate research shows us that such storms are becoming the new normal due to dramatic climate change caused by industrial capitalism. The last two months provide another glimpse as to what will happen when such climatic change meets a crisis-ridden capitalism with all its cuts to public services, privatization, deregulation, over-extended and under-maintained infrastructure, cost-cutting, impoverishment, structural dependence on ever-expanding production, and simple white-collar theft. A report from the Department of Emergency Services and Public Protection found that had Irene been a Category 1 hurricane when it hit Connecticut, it would have caused a near total outage of the state and—assuming the same number of crews available—would have required 67 days to restore all power. A Category 3 hurricane would cause a 100 percent outage of the state, requiring 157 days to restore all power. The National Weather Service says a Category 3 hurricane in Connecticut is inevitable. 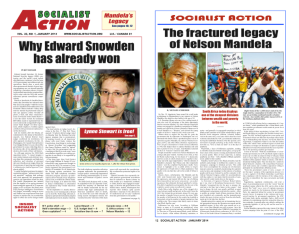 > The article above was written by Daniel Adam, and first appeared in the December 2011 print edition of Socialist Action newspaper.